This is Caleb. Our son. He is the happiest, easiest, most contented baby you can imagine. He smiles with his eyes and his entire body, often looking as if he’s about to burst with the sheer joy of being alive. He loves hearing the sound of his own voice talking to himself and anyone who will listen. He has the brightest, bluest eyes I’ve ever seen and he melts everyone he meets, including complete strangers on the street. He has also been diagnosed with Down Syndrome. He is not what we expected. But he has already brought us more joy than we could have imagined. He is beautiful, healthy and strong. To us, he is perfect. He is a fighter. He has proved the medical professionals wrong time and time again. He has broken off every expectation put on him and out of every box health professionals try to make him fit into. He has proven wrong every preconception, mold and stereotype that has been put on him and overcome definition time after time. They said he would most likely have health issues and that he would develop much later than his peers. He has been thriving and developing in some ways much earlier than what is considered ‘normal’. He first smiled at 5 and a half weeks, slept through the night at 8 weeks and rolled over at 12 weeks. The average age these developmental milestones are hit are 6 weeks for smiling, anywhere from 4 months to 3 years (!) for sleeping through the night and 5 months for rolling over for most babies. They said he would have heart problems, as many babies with Down Syndrome are born with heart defects and require open heart surgery in their first year of life. Caleb also had what looked like a problem with his heart in one of his scans during the pregnancy, which made them sure that he would have heart issues. Yet Caleb now has a healthy, whole heart. They couldn’t quite believe this, performing test after test to try to prove their prognosis right. Time and again they tried to hide their looks of bafflement when every test came back saying that his heart was 100% whole. They said he would get ill easily and very often. For the first 5 and a half months of his life he didn’t catch so much as a cold. One of Caleb’s favourite things to do is pose like Superman. 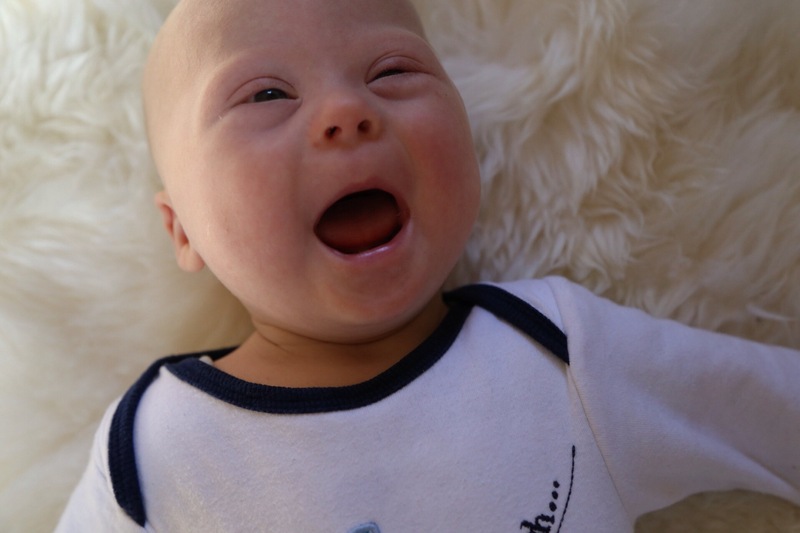 They said almost all babies born with Down Syndrome have very weak muscle tone and are floppy (known as hypotonia) for the majority of the time they are babies. From birth, every midwife or health care visitor who has seen him has commented on how excellent his muscle tone is and what a strong boy he is, even by typical standards. He has been a wriggler (and a future footballer, judging from the strength of his kicks) from the womb onwards. He has always been determined and known what he wants and many times has been strong enough to get it. They said that often babies with Down Syndrome have trouble breastfeeding. 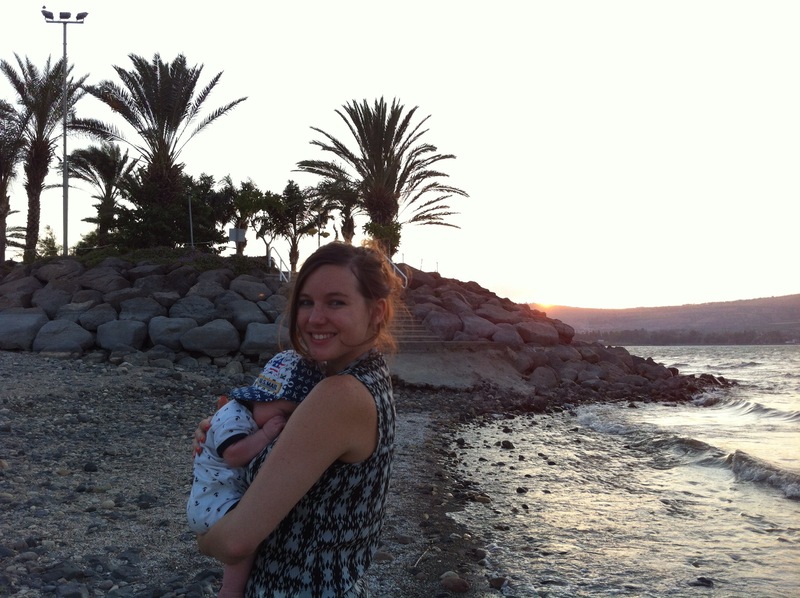 This has been a battle for us, as for the first part of his life he did refuse to latch on and I would express every feed, every day and night in order for him to have breast milk. For 16 weeks I would try to get him to latch on almost every day, and when he wouldn’t be able to I would attach myself to a pump every 3 hours to express enough milk for him to feed from a bottle. It was hard. After four months, I had reached the end of my rope and had given up completely. We made the decision to wean him off breast milk and switch over to just feeding formula. Just before making the switch, I thought I might as well make one more last ditch attempt at breastfeeding, even though I was told and was sure that after four months of bottle feeding there was no human way possible he would latch on. On our recent trip visiting his grandparents, aunt, uncle and 8 cousins in Israel – this was taken on the coast of the Sea of Galilee. He latched on straight away and fed for over an hour. Something suddenly clicked and he has now been breastfeeding and latching on with no problems for two months, gaining weight and being contented and happy after every feed. It’s an actual miracle and a direct answer to a prayer we prayed every day for four months. We have been praying for him constantly since being told at our 20 week scan that there was a problem. They said he had excess fluid on his brain and what looked like a problem with his heart. We were told he could have long term brain damage and heart issues and that we should think about aborting our baby. This was most likely the hardest time we had ever been through in our lives. Yet through it all, unbelievably, there was a peace. A peace that made no sense, a peace that went against everything we were being told. The support and prayers we have had from our families, church family and friends from that time until now was and has been incredible. We are so, so thankful for it. Two weeks after the initial scan just before Christmas last year, after two weeks of having many people praying hard every day, we went back to have a scan by a heart specialist. She told us his heart was now 100% whole with no defects whatsoever. Miracle. We continued going to the fetal monitor unit in Bristol for scans throughout the rest of the pregnancy to monitor the amount of fluid on his brain. The consultant’s projection was that the amount of fluid, which was classed as severe ventriculomegaly and hydrocephalus, would continue to grow and take the space needed for his brain to develop, potentially causing severe long-term brain development problems. He said our baby would most likely need to be rushed off for major surgery as soon as he was born. He spoke to us at length about terminating the pregnancy, even after we said that would not be an option for us and we would love our child no matter the outcome. He kept pressing the issue, saying that although the legal limit of abortion in the UK is 24 weeks, if we changed our minds after this point it would be considered a ‘grey area’ and implied that something could be ‘worked out’. We were offered screenings for genetic and chromosomal conditions, which we declined since we knew it would make no difference to us of whether we would keep the baby. We later discovered that if there is found to be a significant risk in pregnancy that a baby would be born with Down Syndrome or a variety of other genetic or chromosomal conditions classed as disabilities, it is legal in the UK (and many other countries) to abort until the day the baby is due. Approximately 92% of babies diagnosed with Down Syndrome in utero are aborted (many times with diagnoses that turn out to be false). On the UK national healthcare website, they list several reasons why, in their medical opinion, ‘abortion may be necessary‘. One of these reasons they list is if there is a ‘significant risk’ that the baby would be born with what they would consider a disability. Apparently, according to the government (which is a reflection of the society we live in, not just in the UK but all over the western world), babies with Down Syndrome or other conditions labeled as disabilities are seen as less than human. All this, however, made no difference to us – our minds were made up. We would keep and love the baby we were given, even if they were different to what we had been expecting. We would pray for their healing but we would love them for who they are, no matter the outcome. We continued to pray and every time we went to the specialists in Bristol, the amount of fluid either had become smaller or the brain had grown and developed to the point until, at the end of the pregnancy, the consultant said he simply wasn’t worried about it anymore and that it should no longer affect our baby’s development. He said that our baby would no longer need surgery straight away, that I could be classed a low risk pregnancy again and that we would be able to take our baby home as soon as he was born. He said we were a very interesting case and to stay in touch as it could change the way he advises couples in the future. Miracle! Caleb (Calev in Hebrew) – a name we had decided was our favourite and that we felt God had given us at the beginning of the pregnancy before we knew any of what was going to happen with his heart – means whole hearted. It also means brave, courageous and strong warrior after Caleb the giant slayer in the Bible. He has already been all of these things. Rafael, his middle name, in Hebrew means God has healed or God is healer. We believe that the healing process began in the womb, beginning with the heart. We believe it is continuing every day and will continue for the rest of his life. God has been good to us. These last few months have been a journey for us. We needed time and space. Time to process, to ask the why and the how. Why we weren’t given the child we had been expecting. How his life will look and how our lives will look from now on. Space to be a family and heal together without having to answer painful questions. And time for healing to come through the wonder and beauty of creating a tiny human being, one so like us yet so entirely unique and individual. Time to get to know this beautiful, perfect little person with a big personality that God had entrusted us with, different to how we imagined our child would be yet a blessing unlike any we have known. Time for others to get to know him for who he is, a gorgeous, happy boy full of life and wonder, instead of seeing him through the lens of preconceptions and stigmas our society has placed on people different to us. Time to rest and become rooted in a place of deep peace. And time to grow in thankfulness for this gift from God that has brought a richness and joy to our lives we couldn’t have imagined. Caleb, first and foremost, is our son. His diagnosis is a side point, not who he is. His identity is and always will be not as a ‘Down’s child’ but as a child of God. We have come through this storm knowing all shall be well and the closeness of God as Abba Father in an entirely new way. And we are confident that our son will grow to change the world for a better place. He has already changed ours. How can I be thankful after having a child with Down Syndrome and then being told a diagnosis of cancer – all before the age of 27? The day our world stopped turning.